Another amazing maharashtrian dish is the Patodi rassa bhaji recipe which is a Maharashtrian Besan ki sabji. This amazing maharashtrian dish tastes just fabulous when eaten with bhakri or phulki. Patodi rassa bhaji is made in various parts of Maharashtra with some variation in the Rassa of the patodi rassa bhaji. Rassa is the red spicy Gravy which is the base for the patodi bhaji. This maharashtrian delicacy is known as Besan ki sabji in hindi. In Maharashtra you will find many variations of the patawadi like coriander / kothimbir patawadi, methi patawadi etc. You can use any of these variation of patawadi in this rassa bhaji. In Maharashtra there are many variations of the patodi rasa, like the Nagpur style rasa which contains khus – khus or poppy seeds in the gravy paste. While making this amazing dish make sure to add Dry coconut and onion in this gravy paste. The authentic maharashtrian style patawadi rassa doesn’t include the use of tomatoes. This fabulous dish can be made by using khandeshi kala masala, kolhapuri garam masala or any garam masala. 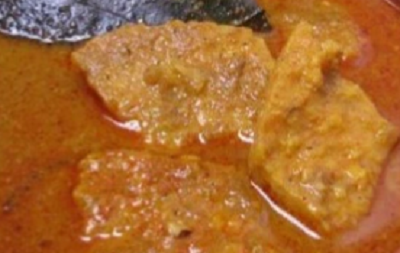 Read on to see the step by step recipe of tasty patodi recipe. In a pan heat 1 tbsp of oil. Once the oil is hot add asafoetida, cumin seeds and sesame seeds to it. When the seeds start to pop, add the red chilli powder, coriander powder and turmeric powder and mix it well. Now add 2 cups of water to the pan and let it boil. Once the water starts boiling, slowly add besan to the pan and stir it continuously. Batter of Patodi shouldn’t be smooth. It should have small granules of besan. Cover the lid of the pan and let it cook for 7-8 minutes. Make sure to open the lid, and stir it occasionally on low flame. Cut the patawadi in the shape you want and your Patodi is ready. For making the gravy take a pan and heat 1 tsp oil and roast onion in it till it becomes light brown. Add grated dry coconut to the pan and roast both onion and coconut to brown color. If you are using khus-khus, you need to roast it separately for 2 minutes on low flame and add it to the coconut and onion mixture. Now add the roasted onion and coconut in a mixer jar and to it add the ginger and garlic and make a smooth paste from it. Now in a big pan heat 1 tbsp of oil and add a bay leaf and cumin seed to it. Now add the onion and coconut paste to the pan and sauté it until oil starts separating from it. To the onion and coconut paste add the spices that is red chili powder, coriander powder, turmeric powder and garam masala powder. Mix everything properly and let it sauté on a medium flame for 1-2 minutes. Add 3 cups of water to the mixture and let it boil. When the rassa starts boiling lower the flame and cook for another 3-4 minutes. Finally add Patodi pieces to the rassa and let it cook for 2 minutes. Now cover the pan and put of the flame. Serve the Patodi Rassa 10- 12 minutes later garnished with coriander. It tastes best with hot chapatis, bhakris or phulkis. Don’t forget to serve onion and lemon slices with this delicious dish.